I have just fitted my new wheels and tyres, they are 265/75/16 mud terrains. I am getting some rubbing on the inside of the wheel arches at full lock. my first thought was to adjust the lock stops but I could really do with not having to increase the turning circle so I thought about spacers instead. As the wheels are now, they come out just past the arches by a few mm so with spacers they with stick out by 30mm or so. I have read conflicting things about this affecting the MOT, some say that if the wheels extend past the arches it will fail an MOT and others are saying that it won't. hi jammer hw u doing? superb! thanks guys, it has recently been MOTd but I'll maybe invest in some wider arches before next year. Ach well I'll chance it then and see how it goes, cheers! The only thing about wheel spacers that i have heard is that they can be heavy on your wheel bearings i have never had any trouble with them but i think there is some truth in it. Jammer, have you got any pics of your motor with the new tyres on it? I'm just about to order a set that are 10mm wider than yours and wouldn't mind a look to see how they sit.... what rims are you using? Hi Roz, I'll nip out tomorrow with the camera and take a pic, it looks tons better than the old ones, they're on 16" modulars. Alot of the time wheel spacers are a must depending on the size of the tyres i could do with them as my tyres rub on full lock which is a pain maybe i will invest in some one day. jammer wrote: Hi Roz, I'll nip out tomorrow with the camera and take a pic, it looks tons better than the old ones, they're on 16" modulars. Cheers mate, it's a set of black 16" modulars that I have in garage just asking for some serious rubber! Nice piccys mate what a diffrence it has made there will be no stoping you now. Admin wrote: Nice piccys mate what a diffrence it has made there will be no stoping yo now. Cheersh mun, aye I'm delighted! Im planning on putting on 235/85/16 on the disco just for more lift. Where did you get your wheels and tyres from mate ind if you dont mind how much did the set you back. How do those ones handle on the road? Well, I was offered a good deal, so I've bought a set! 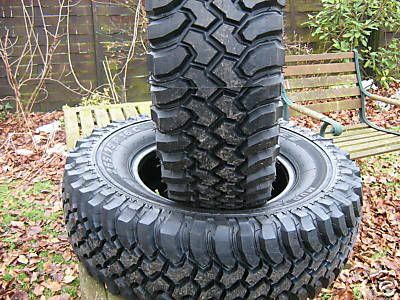 265.75R16 Kingpin Mud Trackers, I had smaller ones of these on a series 3 I used to own and liked them, so £270 for the set of four delivered sounds pretty good!! hope they arrive soon, there is snow to play in!! They look the part Roz a mate had them and he got on great with them there not bad on the road either.